MangaHelpers > News > Site News > xi0 - Senior MH Admin hits 50k posts!! xi0 - Senior MH Admin hits 50k posts!! Every decade, a true legend amongst legends is born, and then, there's xi0. MH's beloved(?) mega super duper admin of the ages has hit the incredible landmark of 50 000 posts, showing his TRUE dedication to the site. May the spam high quality posts be with this yung one, and may he bless our forum for long enough to hit the no-life achievement of 100k. If everything is Nicolas Cage....what does that make me? ....What does that make Nicolas Cage? Wow that is just plain incredible, someday I wanna. I'm just here to wonder how? 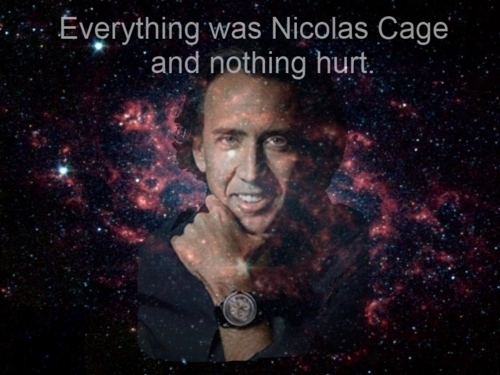 Everything is Nicholas Cage and Nicholas Cage is xi0. Thank you. I have been unified and liberated. What a spammer. Next year vote for xi0 for most spammy please. It only took him 8 years and 9 months.